the simplicity and quality of their village's native cuisine. "This place has been excellent every time we have eaten there. I recommend the super mex burritos they are the perfect size and full of flavor. The staff is kind and friendly." "Wonderful! Fast, friendly service, huge portions of deliciousness on the plate, environment, you name it! If only I lived closer! I'd live on the stuff. I'm getting angry now just thinking about how far away it is from me and my longing belly..."
"Love this place! Super friendly staff, great food for a great price. I always get something different but the authenticity is incredible. Thanks Super Mex! See you next week :)." 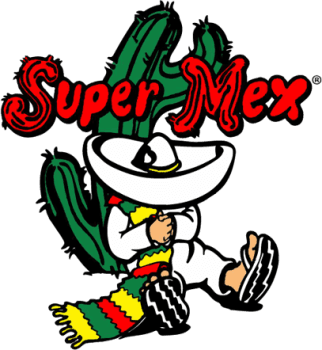 Purchase Super Mex Gift Cards and Apparel Coming Soon!